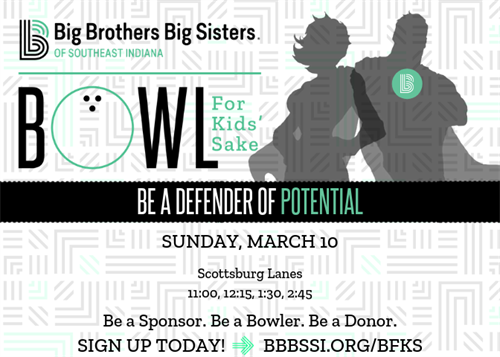 Become a Defender of Potential and join us as we strike up the fun at Bowl For Kids' Sake on Sunday, March 10th at Scottsburg Lanes. 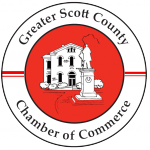 Bowling times are 11:00 a.m., 12:15, 1:30 and 2:45 p.m. All proceeds benefit the Big Brothers Big Sisters community-based and school-based mentoring programs in Scott County. ~Raise as much money as you can (a minimum of $40/person) and bring all collections with you on the day of the event. ~While there, each bowler will receive 1 hour of free bowling, free shoe rental, an event t-shirt, and the chance to win prizes! A silent auction and raffle takes place that day as well, so you can bid and win your favorite item! It's all sorts of fun, and a great way to spend a Sunday afternoon with family, friends or co-workers. Call the Big Brothers Big Sisters office at 522-9699 for more information or email us at mail@bbbssi.org. Minimum of $40 per bowler.